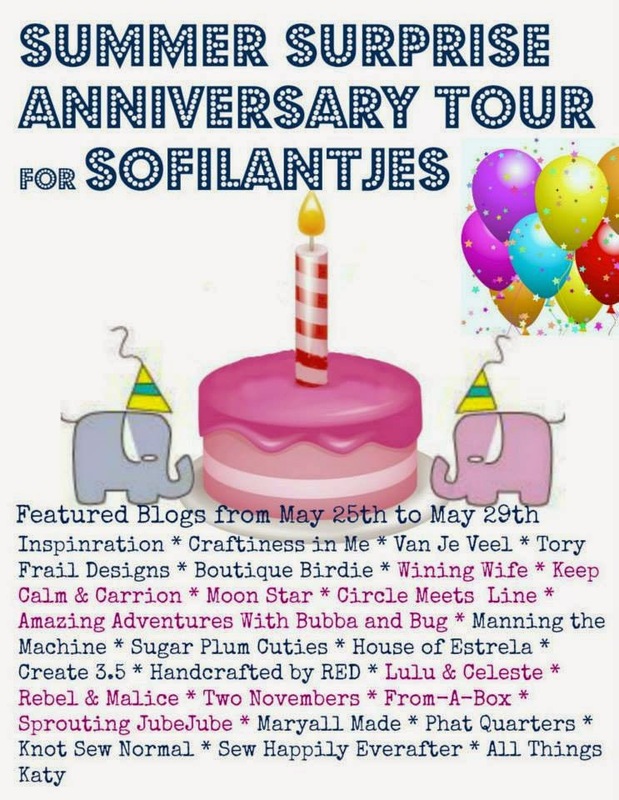 Welcome to the Summer Surprise Anniversary Blog Tour! I have been working with Anne Jacobs for quite a while. The Summer Surprise pattern was the first pattern I saw of hers and I knew that I had to make one for my daughter. At that time, I had barely unpacked my sewing machine and didn't know how to do most things. But I just knew I needed to make one. 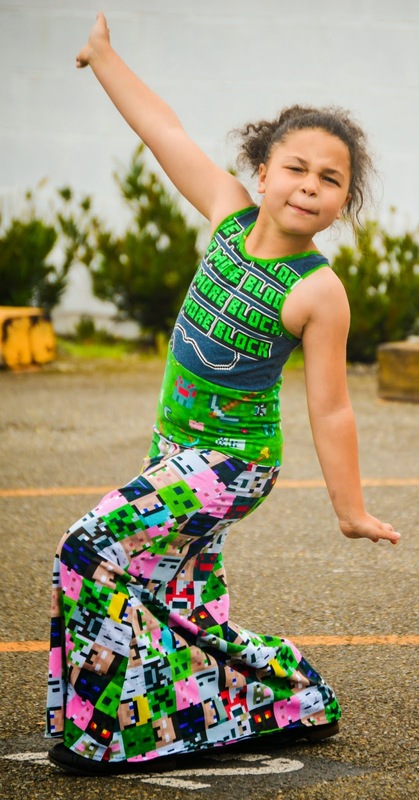 I was lucky enough to get picked to test the extended Summer Surprise sizing for my daughter. And then I offered to help her behind the scenes promoting and sewing and being a part of the Sofilantjes family. And I have loved every moment! I just knew I had to beg to be a part of this blog tour! And I had an idea on how to hack this pattern and give my darling Diva a dress she would die for! 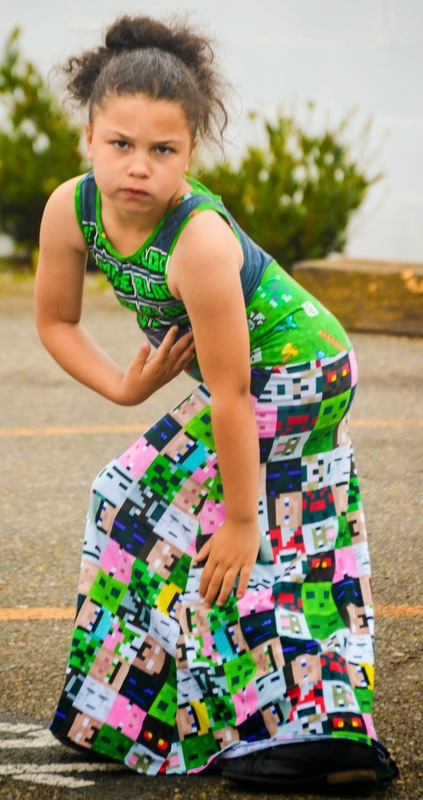 I bought some Minecraft fabric for my son that he went wild over and my Diva had been begging me to let her have what was left. So I knew I wanted to use that. 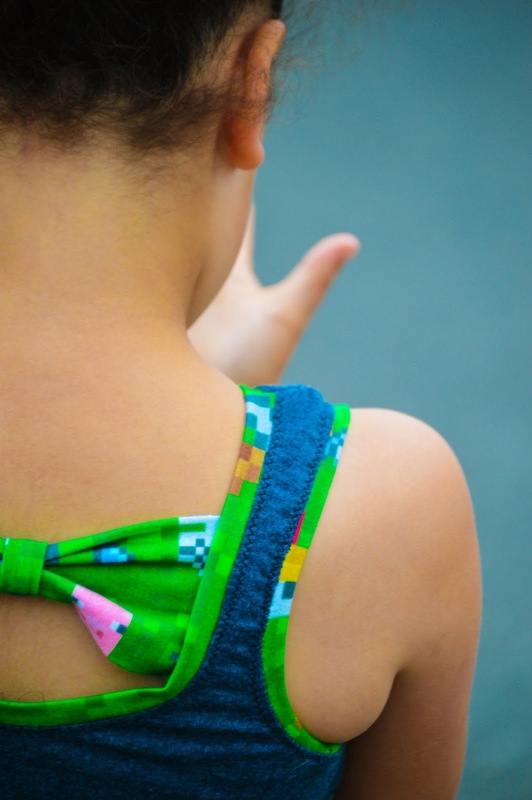 Now, maxi skirts are my Diva's new craze and everything needs to go "to the floor, Mom!" But how to turn the Summer surprise shirt into a maxi dress? First, I measured from my daughter's shoulder to where I wanted the bodice to end and cut the shirt pattern to that length plus seam allowance. Now here is the trial and error. 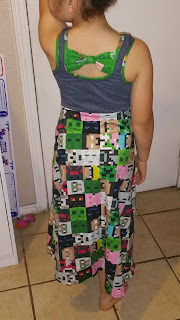 I used the Greenstyle Amy Maxi skirt to define the shape of the skirt. Any long skirt pattern would do, this was just the one I had on hand and I cannot draw well enough to handle simple shapes. Sad, I know!!! To which I was given the feedback... "it isn't long enough mom!" Now I was working with a t shirt and the scraps of my yardage so I needed to figure out a way to lengthen this dress and make it match. I estimated needing another 6 inches to give me the final length I desired. Instead of cutting two pieces, I cut one large waistband-like strip and put it in the middle. And she loved it! 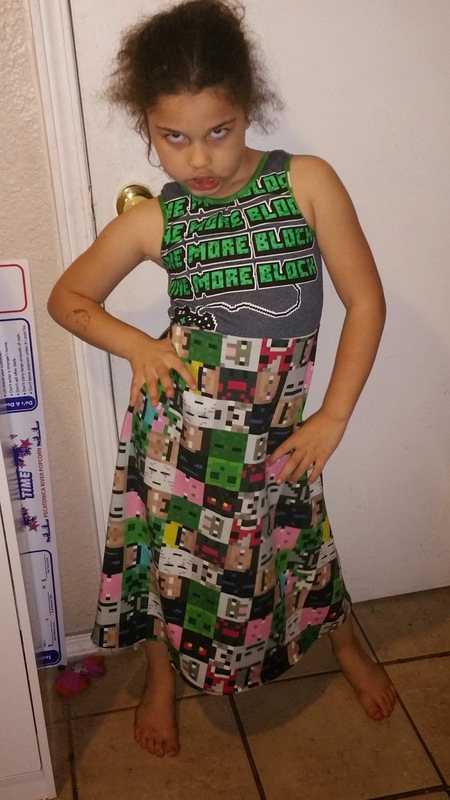 She now refers to it as her Minecraft Princess dress! 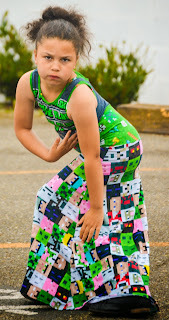 And I got some super high fashion modeling from her! :) She keeps me laughing! The details are to die for! So now for the fun part! 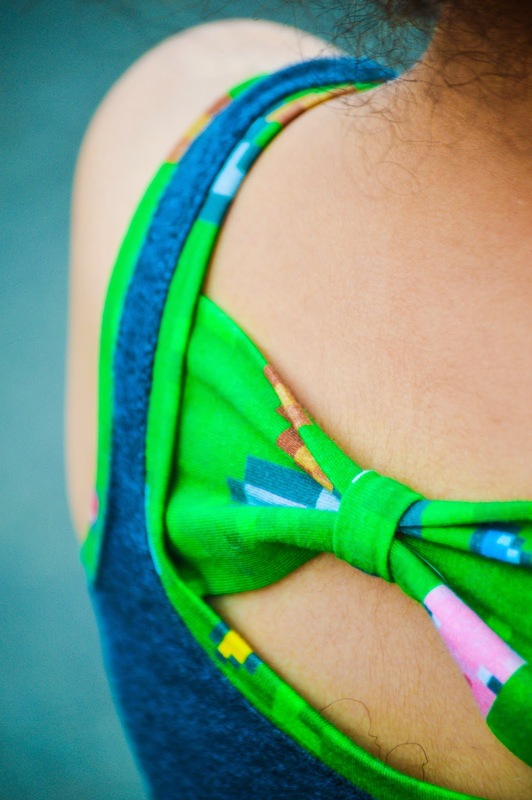 The Summer Surprise pattern has been re-released in a new updated format. 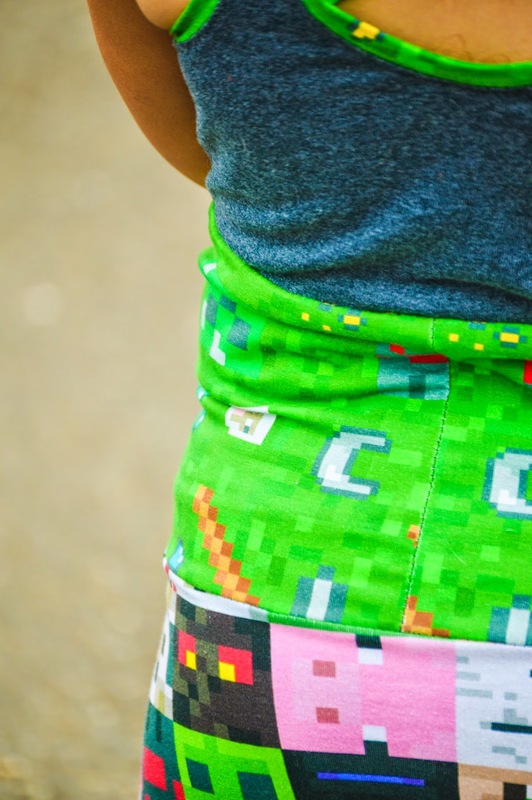 If you already purchased this pattern, just reach out and you can receive your copy. 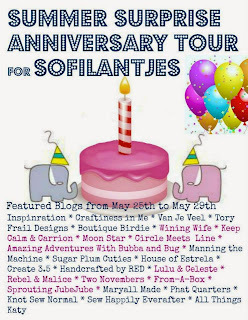 If you don't own it yet, head over to www.sofilantjes.com and use the code anniversary for 25% off your purchase! And before you leave, enter to win one of our amazing prizes! Because winning things is my Diva's favorite pasttime! 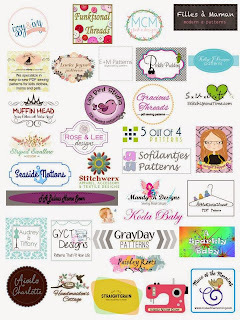 There is a new giveaway daily so don't just enter mine today, check out the links to the other blogs and enter there too! I can't wait to see everyone's creations in the Sofilantjes Sew and Show fb group! Happy Sewing! Oh, my, love your version! It's stunning! I can not say anything other than..... I loooooove it! Your daughter is just soo precious! She's quite the model!!! Love what you have done with the pattern as well. its been a great year, you have really awesome patterns. Oh, what a model! She is just the best :) Great dress, I love it maxi length!